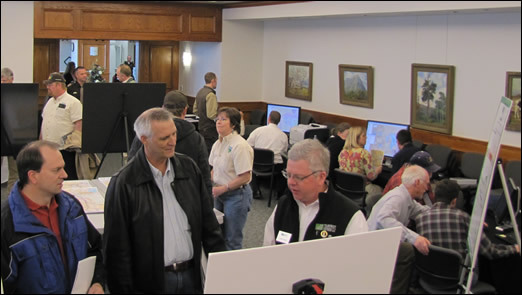 DENVER, March 23, 2011 – Approximately 700 people attended a series of public scoping open houses hosted by Bureau of Land Management and Western Area Power Administration regarding the TransWest Express Transmission Project. The 23 scoping open houses – held in four states over 7 weeks from Jan. 25-March 10 – gave people opportunities to learn more about the TWE Project and its benefits, review potential routes, ask questions, and provide official comments to BLM/Western for the Draft Environmental Impact Statement that the agencies are preparing. However, there is still plenty of time for people to participate in the EIS process, even if they were unable to attend one of the 23 open houses. The BLM and Western are accepting comments for consideration in the Draft EIS through April 4, 2011, as part of a 90-day public scoping period that began Jan. 4. Official comments should be e-mailed to the agencies for their consideration at TransWest_WYMail@blm.gov. TWE would appreciate copies of comments at info@transwestexpress.net. Maps of proposed and alternate routes for the TWE Project are available for the public to review both hardcopy and online. At the scoping open houses, the maps were linked to a unique GIS tool that allowed people to connect their comments to specific map locations. The TWE Project is a regional transmission system upgrade that will deliver 3,000 megawatts of clean and sustainable energy from Wyoming to the Desert Southwest, and its 725-mile proposed route primarily crosses federal land. As a result, the BLM and Western are preparing an Environmental Impact Statement for the TWE Project, pursuant to the National Environmental Policy Act. In addition to facilitating the delivery of more renewable wind energy, the TWE Project will create construction jobs and long-term jobs, will contribute to local tax bases, and will strengthen the reliability and capacity of the western U.S. power grid. For more information about the TWE Project and its benefits to the electrical system, to the environment and to the economy, visit www.transwestexpress.net. TransWest Express LLC filed a right-of-way application with BLM for the TWE Project in December 2008. In 2010, Western Area Power Administration decided to potentially acquire 50 percent of the TWE Project. Western also assumed responsibilities as joint lead agency for the EIS. Copies of the materials presented by BLM/Western at the public scoping open houses are available on the BLM project website.